The principles of co-operative working are timeless but its modern day form may be traced back to the lessons of Robert Owen in Newtown. Owen’s venture was ultimately unsuccessful but the principles lived on in the writings of a Brightonian, Dr William King, in his paper The Co-operator. King was heavily involved in the formation of the Brighton Co-operative Benevolent Fund Association in 1827 which went on to open England’s first co-operative retail store at 31 West Street the following year. Another co-operative organisation, the Brighton Co-operative Society, was founded in 1887. 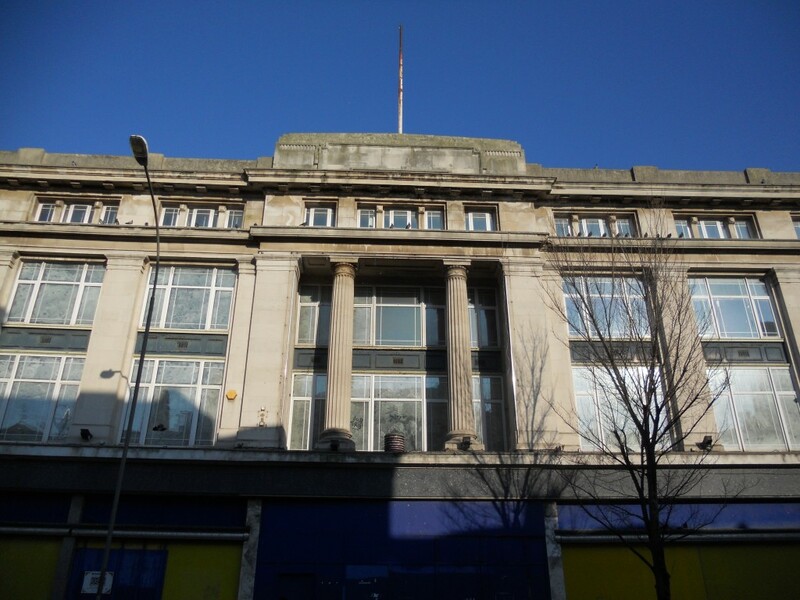 Key to this story was its purchase of 96 London Road as an office in 1900 and purchase of Nos. 97-101 not long afterwards. In around 1919, a single large store had been created. The whole lot, Nos. 96-101, along with a rather handsome classically-inspired villa, No. 95, were demolished to make way for a giant new Co-operative superstore that opened in 1931 to the designs of Bethell & Swannell. The 180ft façade is indeed wide but with four storeys and massive fluted Doric columns, it is incredibly imposing. 1962 saw the opening of the food halls behind on Baker Street. Other extensions followed in 1975 and 1980, which presumably correspond, in no particular order, to the acquirement of an attractive adjoining villa to the north, No. 94, and the adjoining low terraced buildings to the south, Nos. 102-103. The substantial superstore today encompasses Nos. 94-103. 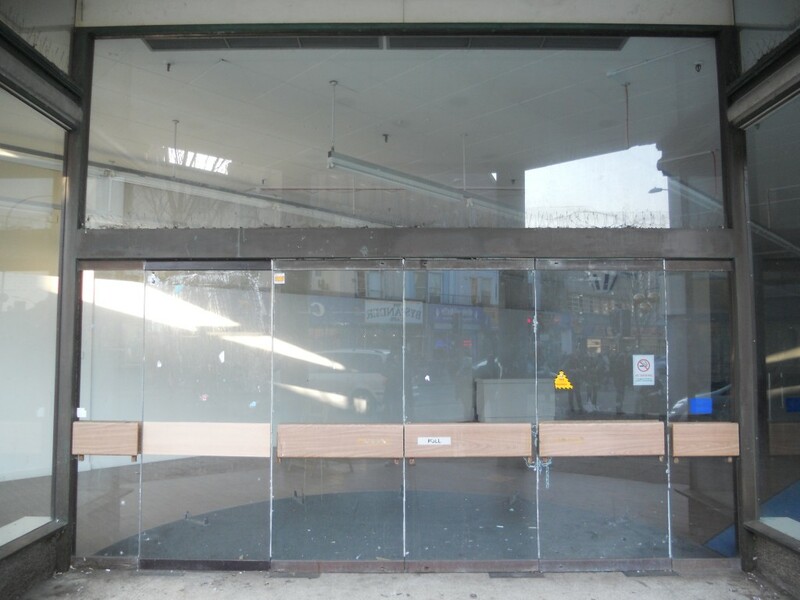 February 2012 is an anniversary for Co-op’s great London Road superstore, for it closed five years ago and has sat empty ever since. The extensions to either side and behind let the building down architecturally, as do its plastic replacement windows, but neither causes as much concern as the rust that is starting to dominate its grand façade. It is certainly encouraging that the development of the Open Market nearby offers real opportunities for the empty building. It is little surprise that demolition followed by the construction of grotty student housing has been suggested but this should not be allowed. If it were up to me, the building would become the new home of Brighton & Hove City Council following the sale of King’s House and the construction of the tower that was planned for the original Hove Town Hall. Such a plan would be ambitious but, as Dr King once showed, Brighton need not be at all shy in thinking big.